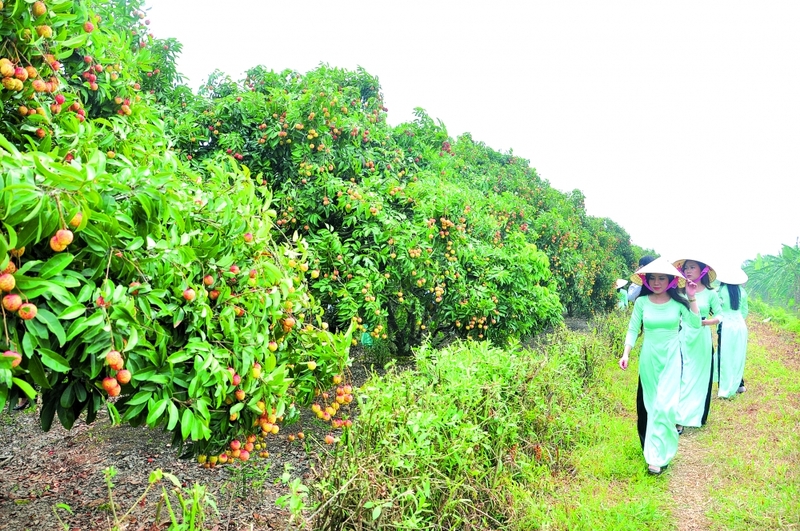 (VEN) - Every year, in May and June, litchi orchards in Hai Duong Province’s Thanh Ha District are busy with harvesting activities, attracting not only purchasers but also visitors. This year, the first-ever Thanh Ha litchi festival was held on June 10 to promote the local specialty fruit. Thanh Ha District is located in the eastern part of the Red River Delta province of Hai Duong, covering 159sq.km, with a population of 158,000. Litchi orchards cover a total area of 3,865ha, accounting for 40 percent of agricultural land in the district. Thanh Ha litchis have become famous nationwide. Litchi growing creates a major source of income and a means of support for a majority of farmers in Thanh Ha District, Chi Linh Town, Hai Duong Province. Thanh Ha District still preserves an “ancestral” litchi tree, the oldest litchi tree in Vietnam planted by Hoang Van Com, born in 1848. Local farmers often come to Thuy Lam Hamlet to visit the tree and pray for bumper harvests. To develop ecotourism, Hai Duong Province has invested in upgrading infrastructure and created tours to litchi gardens. Khong Quoc Tuan, Director of the Hai Duong Tourism Promotion and Information Center, said that visitors to the province during the litchi season can visit the “ancestral” litchi tree in Thuy Lam Hamlet and enjoy picking the fruit in litchi gardens totaling 32ha in Thanh Ha District, which are grown according to VietGAP standards. Nguyen Hong, a tourist from Phu Yen Province, said she was impressed when visiting a litchi garden in Thanh Ha District and enjoyed picking the fruit and tasting its freshness. She only paid VND15,000-20,000 for each kilogram of litchis. Hong said she hoped for opportunities to come back often. Coming back to Thanh Ha this time, we saw its positive changes compared with one year ago. Everything in the district looks better and cleaner, especially the paved asphalt road leading to the “ancestral” litchi tree in Thuy Lam Hamlet. Alongside this road, one can see litchi trees laden with fruit and new, beautiful houses. To attract more visitors to litchi gardens, many people think that farming households should be willing to serve eco-tourists by preparing food and accommodation. To achieve the target of attracting 500,000 visitors by 2020, Thanh Ha District, in particular, and Hai Duong Province, in general, should create specific mechanisms and policies to promote investment in tourism services, transport infrastructure and human resource training. Tourism products need to be diversified along with efforts to promote their popularity. Nguyen Van Luc, Chairman of the People’s Committee of Thanh Ha District, said the provincial people’s committee had approved a master plan to promote tourism development around the Huong River. The district is diversifying tourism products by creating tours to fruit farms, historical and cultural sites, waterway and spiritual tours. A wet rice conservation area will also be built to attract eco-tourists. According to the leadership of Thanh Ha District, the locality will cooperate with processing enterprises to ensure the availability of litchi products for sale to visitors at any time of the year. attention to attracting tourists to Thanh Ha District, a major litchi growing locality in Vietnam.